Calling in on….Dartford, fanfare for the wooden man! 2 Comments on Calling in on….Dartford, fanfare for the wooden man! The town of Dartford doesn’t mean a lot to most people. It lends its name to a tunnel, a crossing and, in 1943, it was the birthplace of one Michael Philip Jagger. It’s in the Kent hinterland and in many ways, mirrors Thurrock on the opposite side of the Thames Estuary. Other than Jagger, Dartford also has connections with a few notables: Malcolm Allison and pop artist Peter Blake (of Sgt. Pepper fame) were both born in Dartford. Margaret Thatcher unsuccessfully ran for parliament in the early 1950s from Dartford. And oh yes, Britain’s strongest man, Terry Morgans, hails from the Kent town of almost 90,000 people. But there’s something really outstanding about Dartford from a footballing perspective that should act as a blueprint for stadiums the world over: Princes Park, the home of the “Darts”. Around this very innovative ground are two advertising hoardings that make you think. “If only all councils were like Dartford” and “If only all football stadiums were like Princes Park”. What’s it all about, then? From the outside, Princes Park looks very attractive, with sleek lines and tasteful facades. It doesn’t look like the average bolt-together ground comprises modern corrugation and slabs of concrete. Some thought has clearly gone into it. Furthermore, it is low level, which we are told is aimed at reducing noise and light pollution. And, most strikingly, although I didn’t notice it myself, the entire ground has a sedum roof blanket, which, for the uninitiated, is a grass roof. In fact, the entire stadium has been built in the name of ecology. Dartford may have had, in its time, may have given birth to some of the trend-setters of the 1960s, but Princes Park is certainly au courant and despite the plea of the hoarding, there are very few stadiums like Dartford Football Club’s impressive home. No wonder the club speaks highly of its local authority. The ground was built and is owned by Dartford Borough Council. There’s also an all-weather pitch for community use and people are encouraged to use public transport to get to games. It works. In most grounds, the huge wooden sculpture cemented into the touchline-length terracing, “The Wooden Man terrace” would be the biggest talking point, but the ground itself has so much to offer that it is merely a sideshow. Nevertheless, this structure is unique, reminding one of the cult film, “The Wicker Man”. I had visions of naked maidens dancing around this statue in the dead of the Dartford night, but perhaps that was the effect of the Youngs bitter I had in the clubhouse bar. 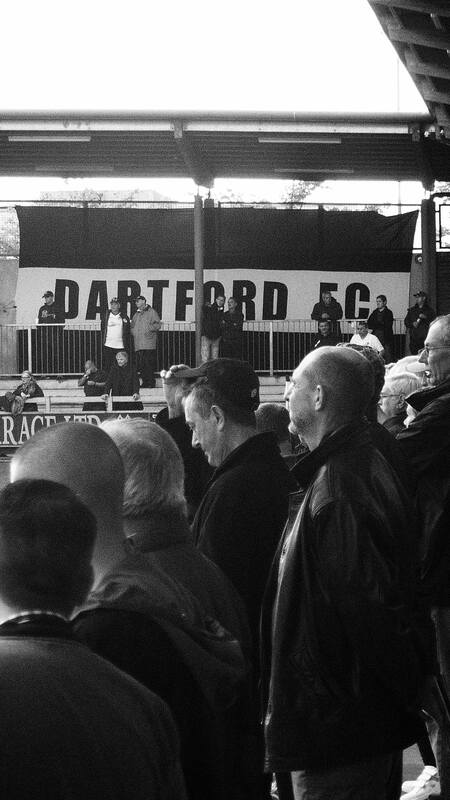 Dartford returned to their home town in 2006 after spending much of the 1990s and early 21st century on the road. Financial problems forced the club to sell its former home, Watling Street in 1992 and withdraw from the Southern League just four games into the 1992-93 season. The club joined the Kent League and became nomads, entering into ground-sharing schemes with Cray Wanderers, Erith, Thurrock and Gravesend. In 2004, Dartford Borough Council announced the funding and building of a new ground for the club. In November 2006, Princes Park opened, Dartford playing Horsham YMCA 4-2 in front of more than 4,000 people. Since then, Dartford have been promoted three times: Isthmian One > Isthmian Premier > Conference South > to find themselves in the Conference National. In 2005-06, the club averaged 291 people per game, today crowds at Princes Park are four figures, with last season’s average 1,250. How often to you get to watch a game through the legs of a big man…? 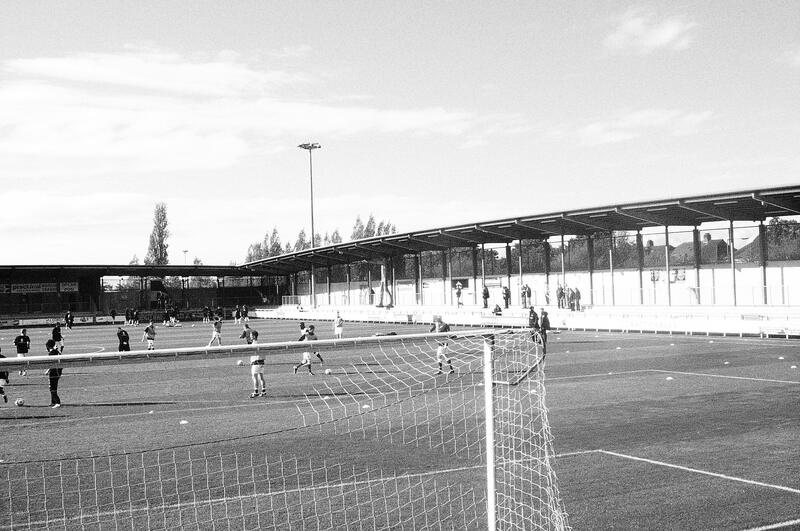 They are in their third season at the top level of the non-league game, but it is not Dartford’s first stint at this level – they had three seasons in the old “Alliance Premier League” in the early 1980s – and finished third in 1984-85. Ten years earlier, they reached the FA Trophy final at Wembley, losing to Morecambe. There’s some pedigree. But in 2014, Dartford are a relative minnow in the company they currently keep, despite their superb stadium and obvious momentum. The Vanarama Conference – I can’t help thinking of Roxy Music’s Pyjamarama – is laden with former Football League clubs that are desperately trying to get back to where they once belonged. Last season, they finished 22nd in the Conference, but were reprieved from relegation after Salisbury City’s financial problems sent them down. The way the current campaign is going, Dartford may have another relegation fight on their hands. Before meeting Macclesfield Town, Dartford were in 19th place after 15 games. They had won just three league games. The visitors were in ninth and had lost just three times. They were only five points behind second place and eight behind early-season leaders, Barnet. A few days earlier, Dartford had lost 1-0 at Bristol Rovers and in their previous home game, they had held Grimsby Town to a 1-1 draw in front of 1,285 people. 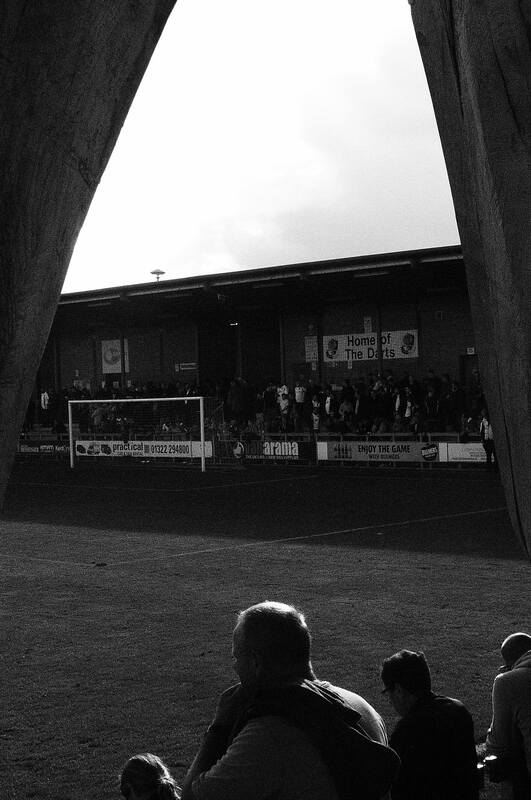 Macclesfield couldn’t have been in better shape after beating Barnet 2-1 in midweek. I was interested to see that player-coach at Macclesfield js none other than Efetobor Sodje. I came across this delightful character in the mid-1990s when he was part of the Stevenage team that won the Conference in 1995-96. He was an outstanding player and instantly recognisable with his headscarf and tall, angular features. He also had amazing self-belief, evidenced by the post-match press conference at Birmingham City where he refused to take any blame for one of the home side’s goals as Stevenage were beaten 2-0 in a FA Cup tie. He could leap like a salmon and if he ever got pole-axed, his ear-piercing banshee-like scream left you in no doubt that he had been fouled! Macclesfield, in their teal-coloured shirts, had the better of the first half, but it was a low-key 45 minutes on a very greasy surface. Danny Harris should have done better when he was set free inside the area and he successfully rounded Macclesfield goalkeeper Rhys Taylor, but then tripped. The home fans called for a penalty, but the incident owed more to Harris’ sense of balance. The best chance of the half came from the visitors, however. A cross from Arthur Gnahoua – a player who stood out in the first half – was met by Paul Lewis and Dartford custodian Jason Brown tipped the ball over the bar. Gnahoua didn’t reappear after the interval, but on came much-travelled striker Matthew Barnes-Homer, signed on loan from Whitehawk. 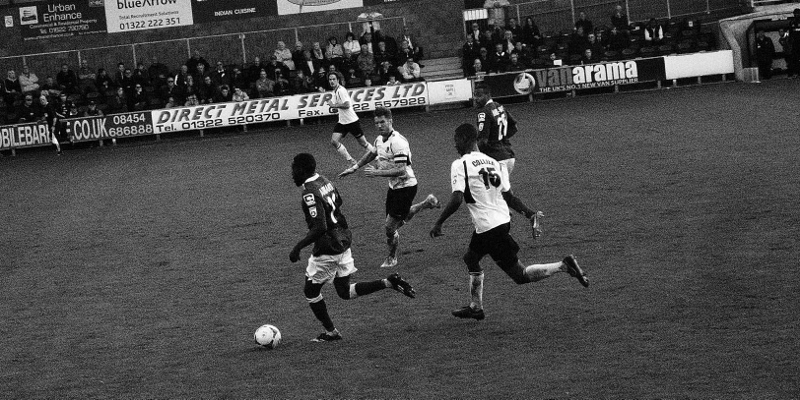 His strength and pace caused Dartford a few problems. But Dartford should have gone ahead in the 63rd minute when Nat Mitchel-King sent an excellent glancing header against the upright. Harris blasted the rebound over the bar. The game seemed to come to life at this point and in the 70th minute, Macclesfield substitute Adriano [Moke] went on a long run, accelerated past two defenders and sent a low, somewhat tame shot against not one, but two posts! Dartford took the lead five minutes from the end, Ryan Hayes controlling the ball well and sending a left-foot effort curling wide of Taylor. Dancing took place around the wooden man in celebration. But the lead didn’t last long, for within two minutes, a low cross was watched by a similarly statuesque Dartford defence and Barnes-Homer slotted into the net from six yards. And that was how it ended, a result that was fair, if not entirely satisfactory for the home side. Macclesfield made it seven draws from 16 games. What was satisfactory was the trip to Princes Park. I doubt there’s no finer non-league ground in the country. It’s a benchmark for modern day stadium development…. Previous Entry Great Partnerships: McFarland and Todd, the best defensive duo of modern times? Next Entry If Catalonia goes indy, what next for Barca?